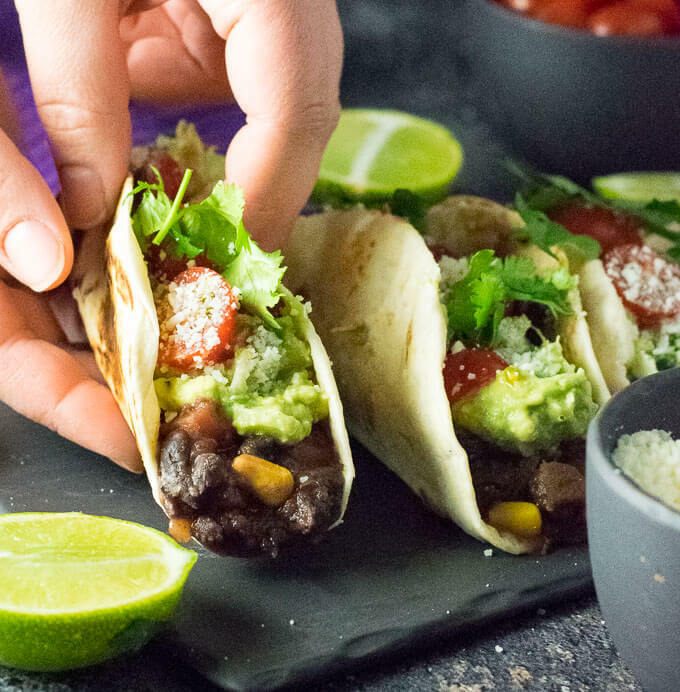 These Black Bean Tacos are loaded with boldly seasoned black beans and chunky guacamole, creating a healthy and satisfying family dinner that is ready to serve in only 10 minutes! Today is the happiest day of my life. My 4-month house remodel is almost complete, but that isn’t why I am so happy. I am happy because the final details are being painted, and I am not the one holding the brush! After applying 3 coats of paint throughout the house, if I never touch a paintbrush again I will die a happy man. 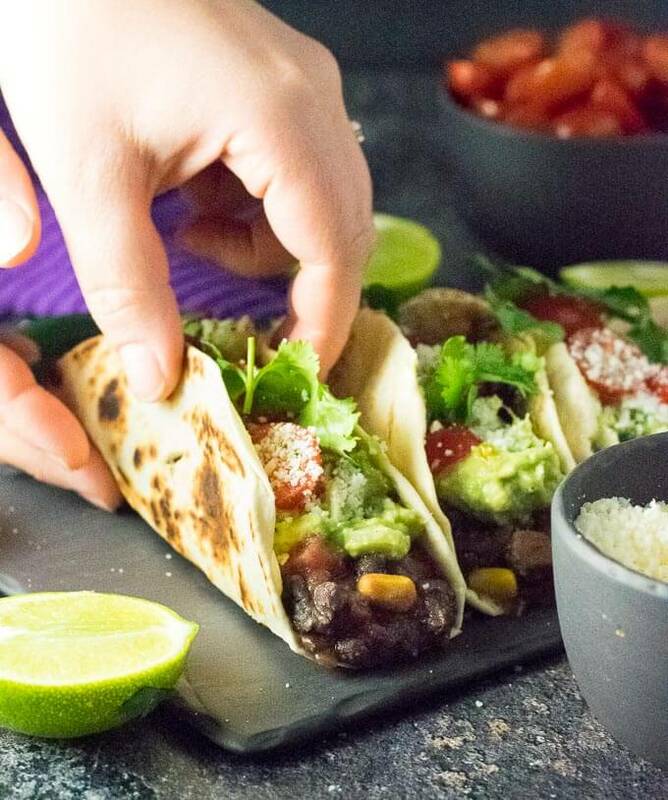 I couldn’t be more excited to have hired this final project out, and instead focus on life’s more important challenges, like making mouthwatering Black Bean Tacos! 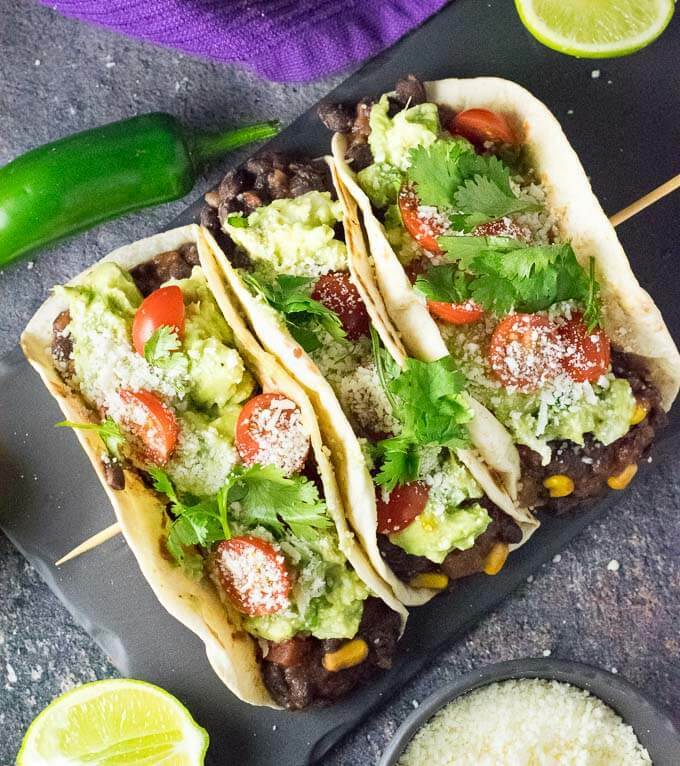 Seriously, these Black Bean Tacos with Chunky Guacamole are my family’s new favorite quick and easy go-to meal. It takes 10 quick minutes to prepare. Everything can be prepped while the beans are heating on the stovetop, but it doesn’t sacrifice an ounce of flavor! The secret in my recipe is simply using Black Bean and Corn Salsa (affiliate link) to season the beans. It works flawlessly. You effortlessly add one 16oz jar of salsa with two cans of rinsed beans in a saucepan and let the beans gently heat in the salsa. Once heated, mashing a few beans will drink up any excess liquid and leave you with an exceptionally flavorful filling for your healthy tacos! Since beans and guacamole both have a creamy consistency, it is important to add some crunch to the guacamole to add varying texture to each bite. This is easily accomplished by adding half of a chopped onion to the guacamole. This is a little more onion than you would typically find in a guacamole recipe, but you don’t want that crunch to get lost among the other taco fillings. You can also improve the dish’s final texture by not over mixing the avocados. Loading these tacos with fresh produce makes them as flavorful as they are healthy. Chopped cherry tomatoes add a bright pop to each bite, while cilantro adds noticeable freshness. I think Cotija cheese, often referred to as the Mexican Parmesan is a perfect choice. However, if you wish to make these vegan tacos, you are free to omit it from the recipe. Add black beans and salsa to a medium saucepan and gently heat to warm beans. Stir on occasion to prevent scorching. While black beans are heating, prepare guacamole by adding avocados, onion, jalapeno, lime juice, salt, and pepper in a bowl. Mash to combine ingredients, leaving avocados moderately chunky. Heat flour tortilla one at a time in a skillet on high heat, flipping once. Alternatively, they can all be microwaved together for 10 seconds. When beans are heated through, mash a few of them with a fork until the mixture thickens slightly. Serve beans in tortillas, top with guacamole, cotija cheese, chopped tomatoes, and cilantro. This recipe would be fantastic with my Authentic Pico de Gallo or my Cilantro Lime Sour Cream topping it as well! 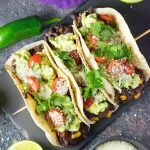 If you enjoyed my Black Bean Tacos with Chunky Guacamole recipe then you should probably like me on Facebook and follow me on Pinterest too. That’s what I would do at least, because if you don’t get to know me but you still use my recipe it is kind of like taking candy from a stranger, and your mom taught you not to do that. Don’t disobey your mom, subscribe to Fox Valley Foodie today. Who knew healthy tacos would be so addicting!